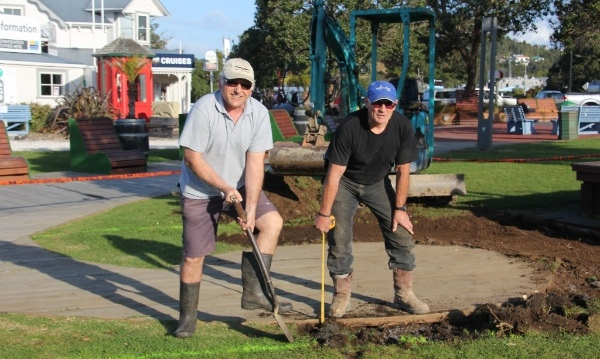 On Saturday 26 September yet more PAIHIA PLACEMAKING PHANTOMS – THE ODD JOB CREW – were at it again. It was a wonderful day! Great support, a great fun atmosphere and lots of work done. Huge thanks to all who rolled up their sleeves, to those who baked the lunch and to those who otherwise supported. Project Driven by HEINZ MARTI the team had great success. Thank you to BRITA MARTI, JULIA JONES, GRANT HARNISH, GARETH DOULL, PATTY DOULL and JOHN BUCHAN for your efforts. 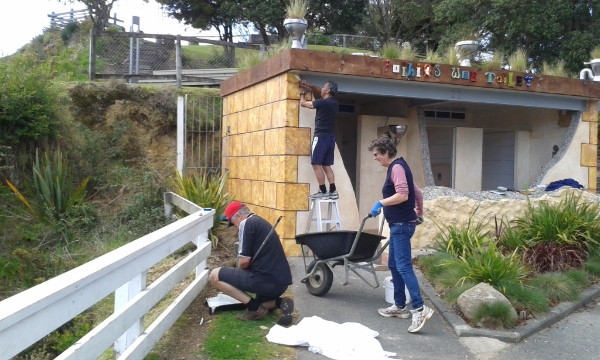 GREG JONES, JANE BANFIELD and BASIL UMUROA tidied up the toilet block and surrounds at the foot of Maiki Hill. The ceiling was painted along with the fence. New plants were planted inside and a the place had a general good scrub down. 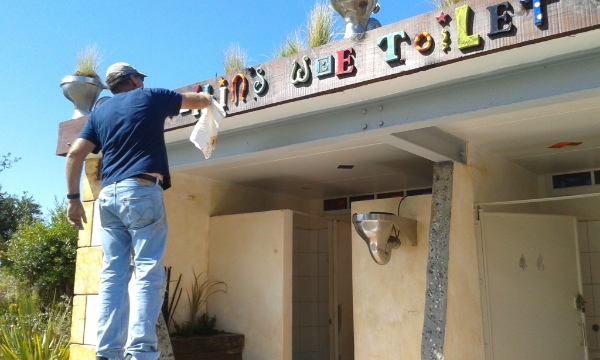 GREG, JOE LAVELL AND BASIL UMUROA worked on top of the toilet block giving the dingy a much needed facelift. ALL PHOTOS: Brita Marti. All of the seats in Horotutu were sanded where there were small bits of graffiti and re-oiled. Great work by TANIA MCINNES, LUCA HARNISH, and STEVE & KARTINI MARTIN. MARGARET RASMUSSEN andKAREN MARKIN re-stained the map board – a brilliant job ladies! JACKIE LAVELL, was happily busy with her gloves and trowel adding new plants to the many tubs and planter boxes about the place, as well as a significant amount of weeding. The Water Feature was re oiled and received new plants. Great work by JAKE HARNISH. There was a well deserved lunch, organised by NOLA. Thank you for the hearty feast MARILYN, GAIL, SUZI, NOLA, ELIZABETH, LOUISE and others who dropped off this much needed sustenance. Nola has a boot full of goodies including a hot water urn and extension cord. But don’t try and close the boot – it mucks up Nolas electronics! Volunteers would be lost with out a cup of tea. Nola, thanks for taking good care of these troops. 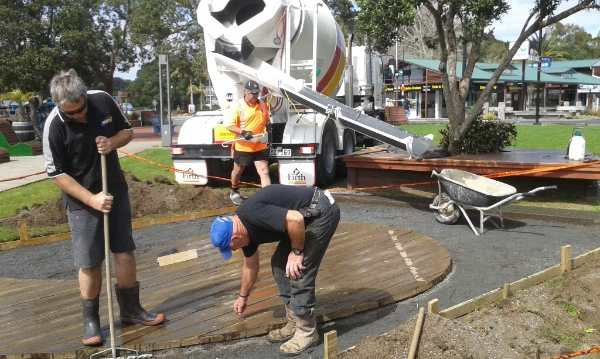 HEINZ & GREG and BRUCE GORDON also put in extra days leading up to this, concreting the area around the piano – where the grass never gets the chance to grow due to all the foot traffic, the piano still as popular as ever! Well done to the ODD JOBB CREW. 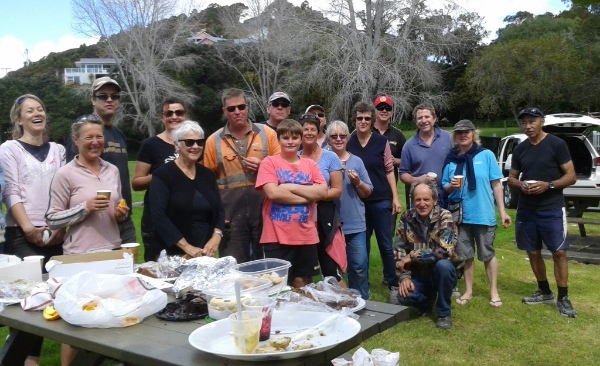 Thank you for all of your efforts that help make Paihia shine!